Don’t just clean your sewer line, see it! Have you ever cleaned your sewer line only to find it is clogged again a few months later? 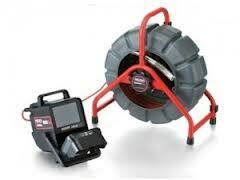 Our sewer video camera inspections can solve your sewer line problems for good. The process is simple: Our professionally trained technicians insert the video camera into your sewer line through your ground level cleanout while you watch on our video monitor. During the video camera inspection, we enable you to see any existing problems in your sewer line; root intrusions, broken lines, foreign objects, low spots (sag or belly), and other visible defects. Do plumbing blockages and backups in your home have you stumped? If you’re having difficulty determining the exact cause and location of plumbing issues, a plumbing camera inspection can help you solve the mystery. A plumbing camera offers a safe, non-destructive method for inspecting the condition of your pipes. This specialized camera equipment allows the professionals to inspect every inch of your plumbing system to accurately determine the exact cause and location of your home’s plumbing issues. Due to the in-depth observations capable with a plumbing camera, we can catch impending plumbing problems before they result in additional obstructions. Peace of mind regarding the condition of your plumbing system or the system of a home you plan to purchase. A fast resolution to even the most confounding plumbing problems by eliminating guesswork and unnecessary repairs. The prevention of future inconvenient and costly plumbing issues with early identification. The identification of leaks that can waste thousands of gallons of water and inflate your utility bills. If you notice that your drains are moving slowly, contact us as soon as possible to prevent the damage and headaches of serious pipe blockages. After performing a plumbing camera inspection, we will explain your plumbing issues and options. This allows you the opportunity to address updates or solutions and prevent future problems that could jeopardize the long-term health of your system. service 24 hour a day, 7 days a week. Appointments are easily scheduled at your convenience. we give you up-front pricing, free of overtime charges. Work is guaranteed and completed right – the first time! Our courteous, considerate professionals never leave a mess. Contact us and schedule your plumbing camera inspection today. were dedicated to the fast, efficient resolution of plumbing issues, helping you get your home – and your life – back on track.